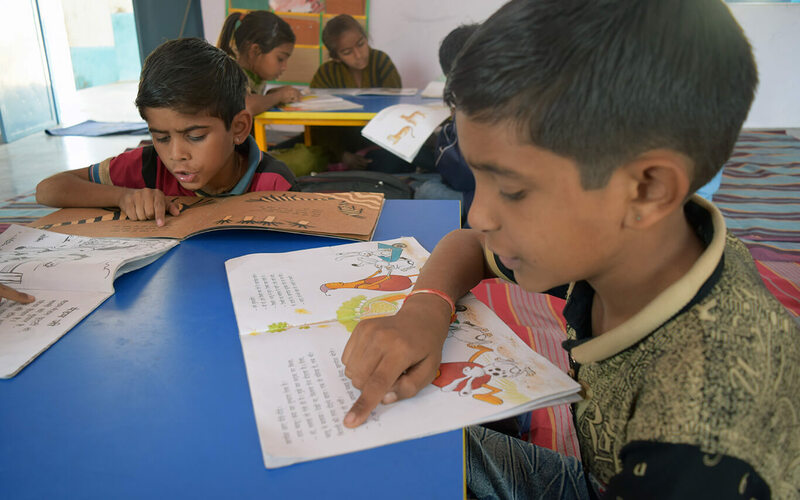 Over the past decade, Parag has worked with several organisations to support, establish and promote children’s libraries and reading for pleasure. 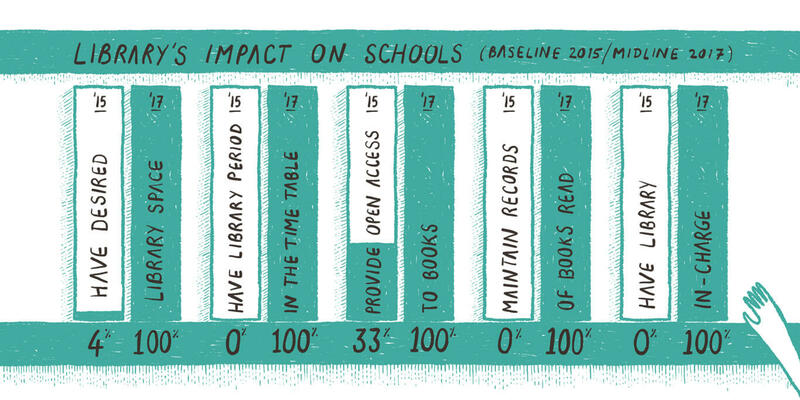 We have supported classroom and school libraries, community and village libraries and also public libraries. 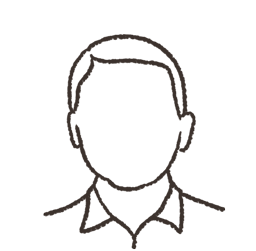 In 2015, Parag took the first step to set up and run libraries directly. The aim is to establish best practices and a model that can be used by others doing library work across the country. Select a state from the map below to know more about Parag libraries in that location. Tribal children have an inherent disadvantage of not being exposed to any kind of literary text, as they are first generation learners and by culture inherit an oral tradition. 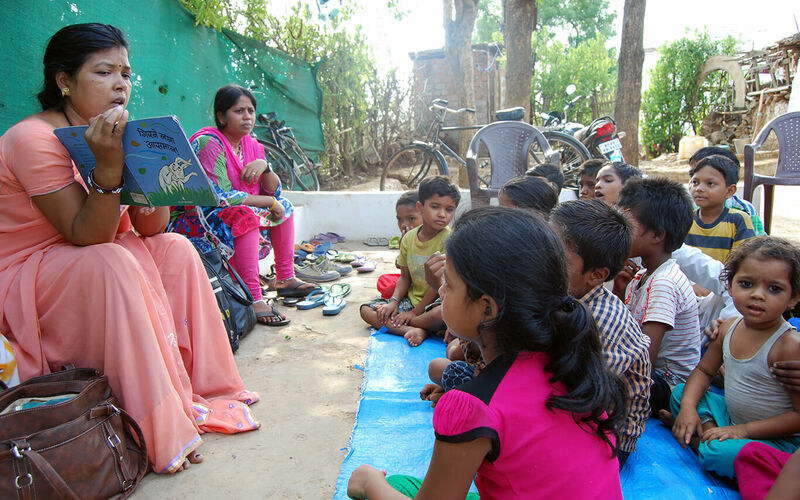 They often struggle to learn the medium of instruction (Odia) and other subjects as their mother tongue (Kui) is different from the state language. 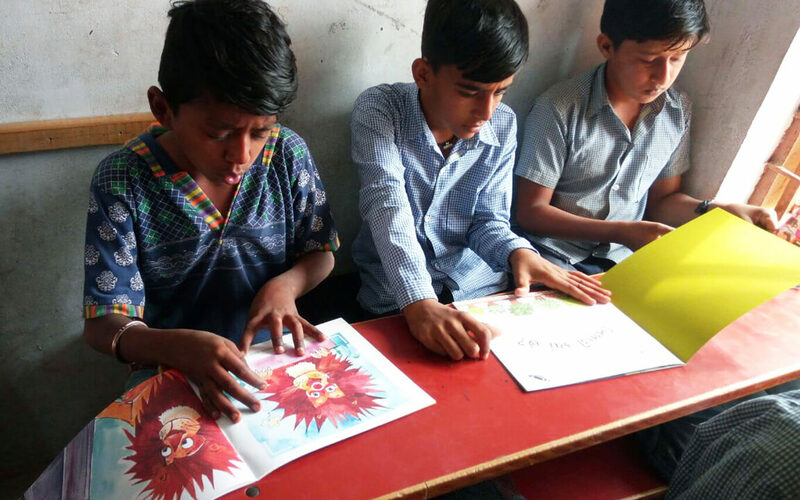 To enable children access to and exposure of good children’s literature, Parag has supported setting up of 64 libraries across three tribal districts in South Orissa — Rayagada, Kalahandi and Kandhamal. 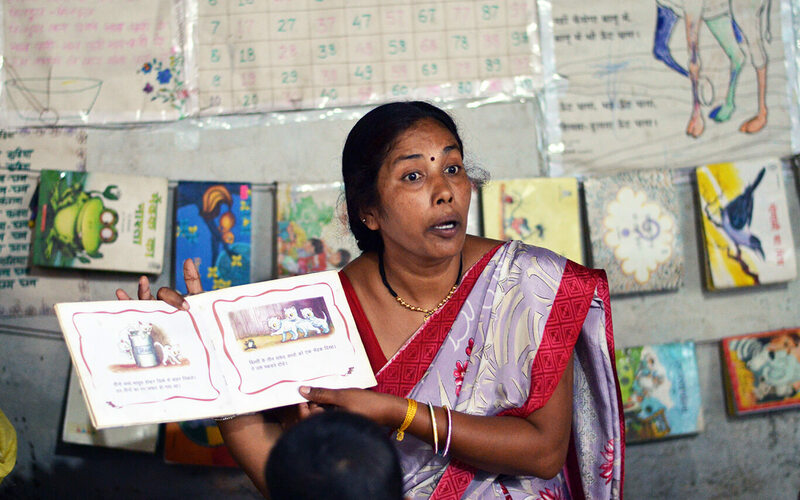 To begin with, 100 unique titles have been provided for primary school children. Training has been provided to the community volunteers to facilitate library activities at least twice a week within school hours. Parag is also in the process of strengthening the book collection by translation a list of 20 titles from Hindi to Oriya. 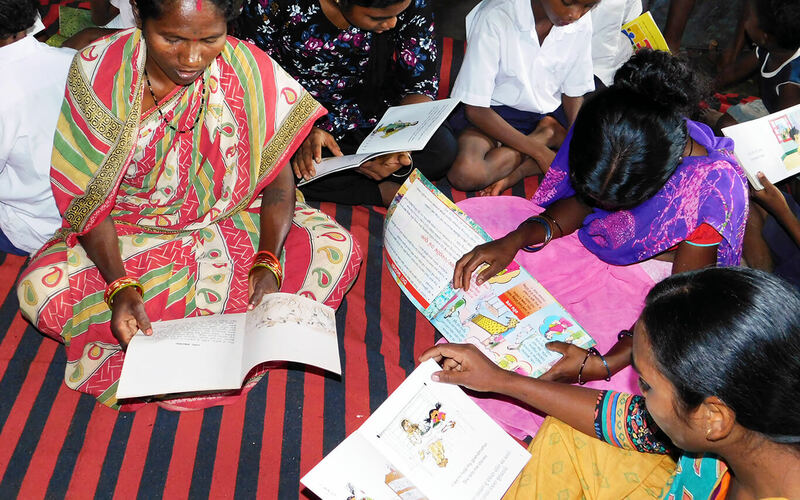 It also supported the setting up of a selection committee that reviewed available children’s books and drew up a list of the best of Oriya children’s books and will facilitate procurement of the same. 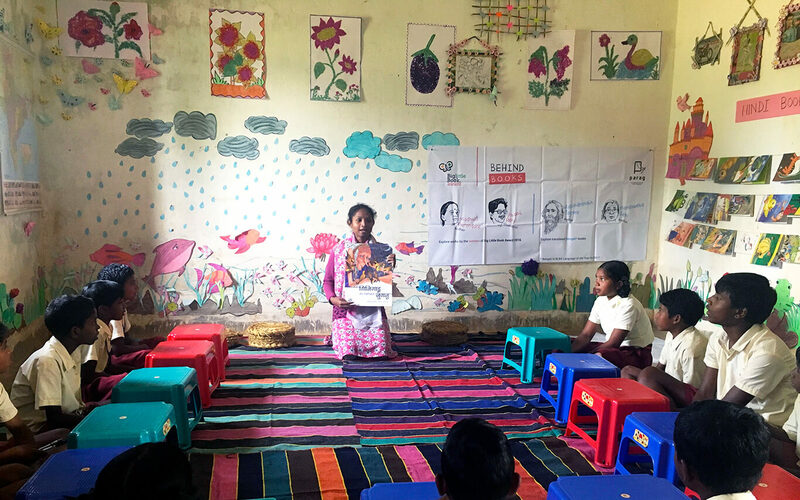 Parag supports library work in Khunti district, which is one of the educationally backward district and the major inhabitants are Munda tribes. 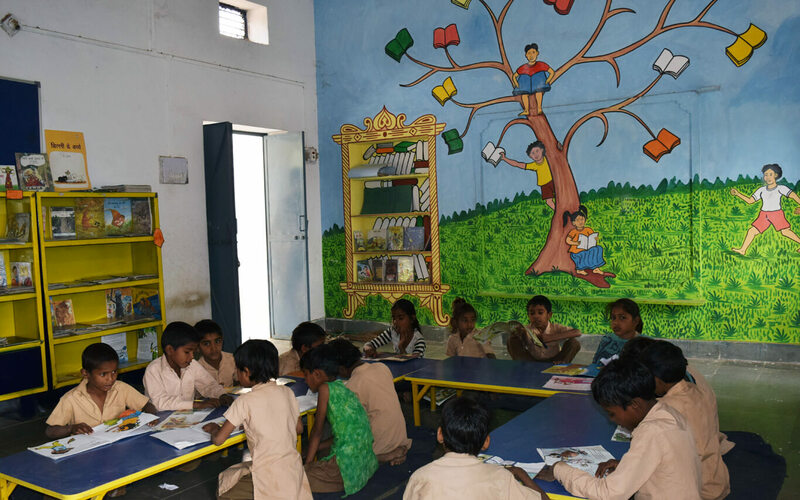 The library work began in July 2015 as part of the Central Indian Initiative of Tata Trusts. 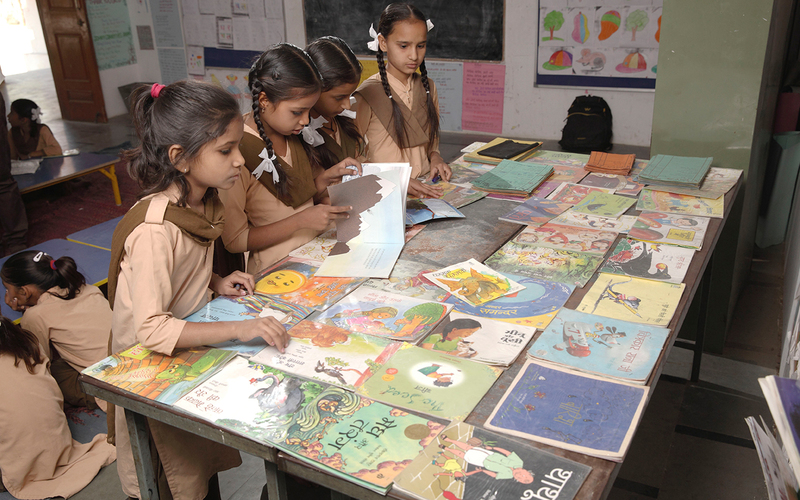 Libraries have been set up across 156 government schools and cater to 15,000 children. Some schools have separate library rooms and others have library corners in classrooms. Since children coming from tribal areas do not understand Hindi, the medium of instruction in schools, books in Mundari were a necessity. Parag translated 29 titles from multiple publishers into Mundari and provided to the libraries. The Mundari story books were a starting point for many children, who were thrilled to read and hear stories in their mother tongue. The books were also read by parents, who had never before accessed books in Mundari. 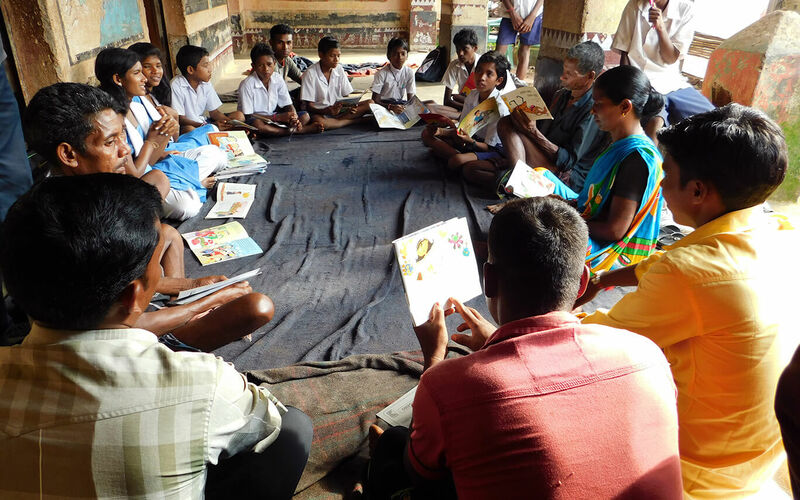 The Library Educator’s Course has also trained several team members to implement library work in Khunti. 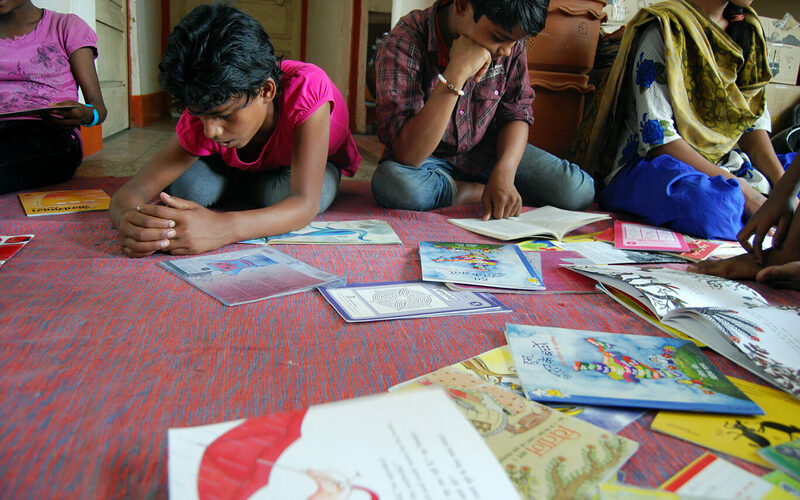 Parag has supported community libraries in urban slums of Bhopal in partnership with Muskan since the last 3 years. Libraries are run at 15 sites catering to children from grades 1 to 8, out of school children, parents and other community members. At a few centres open library is organised under a tree where library staff takes few books with him/her. 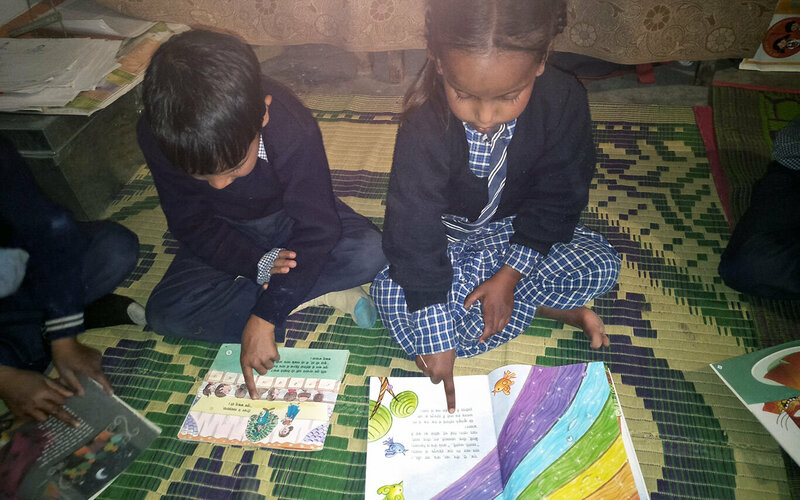 Children browse books, enjoy read aloud and issue the books. 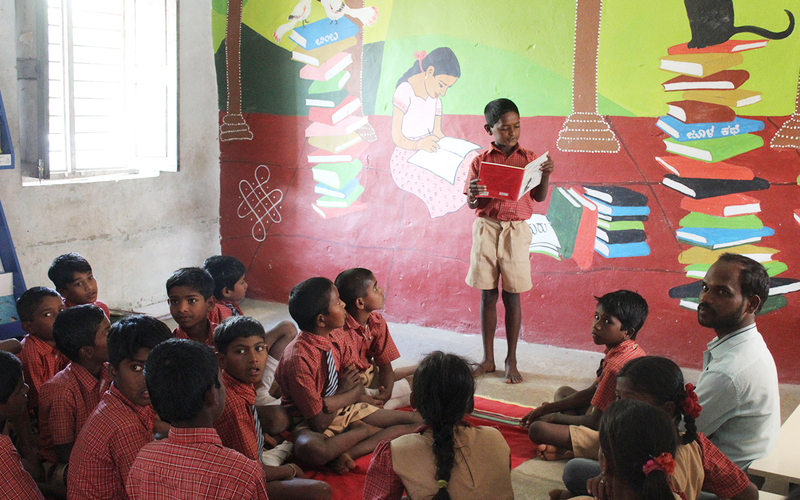 Muskan libraries focus on children living in bastis and shanties in the city where tribal community is dominant. Bhopal has several tribal communities who have migrated into the city. Gonds, Agariyas and Pardhis are the predominant groups Muskan is engaged with. Muskan library facilitators have attended the Library Educator’s Course and strengthened their practice over the years. 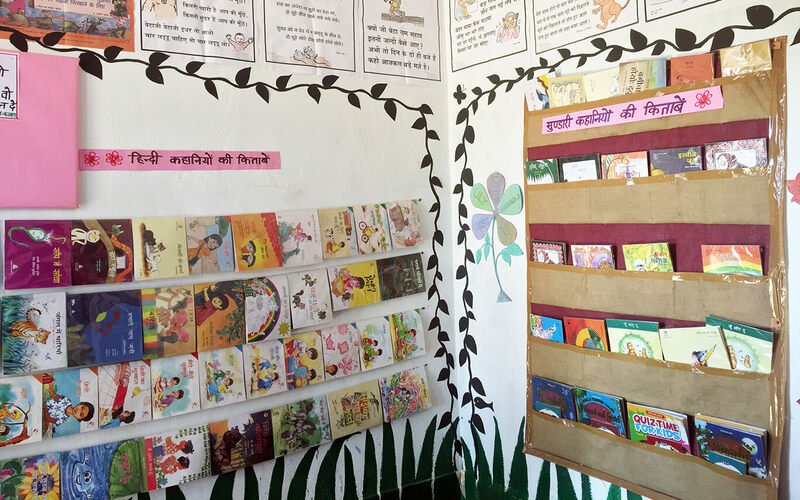 Read a case study of Muskan libraries here. 20 libraries were set up in 2017 in partnership with Coastal Salinity Prevention Cell in coastal area in Dwaraka district. Libraries have been set up in 20 elementary schools and caters to grades 1 to 8. 20 learning assistants take library classes along with remedial sessions. Twenty government teachers were also trained to start libraries in their respective schools in grades which they are responsible for. The idea is that other teachers also take up this practice. The libraries have also benefited from Parag’s Library Educator’s Course. The coordinator who was trained is now providing library leadership to the schools and team. 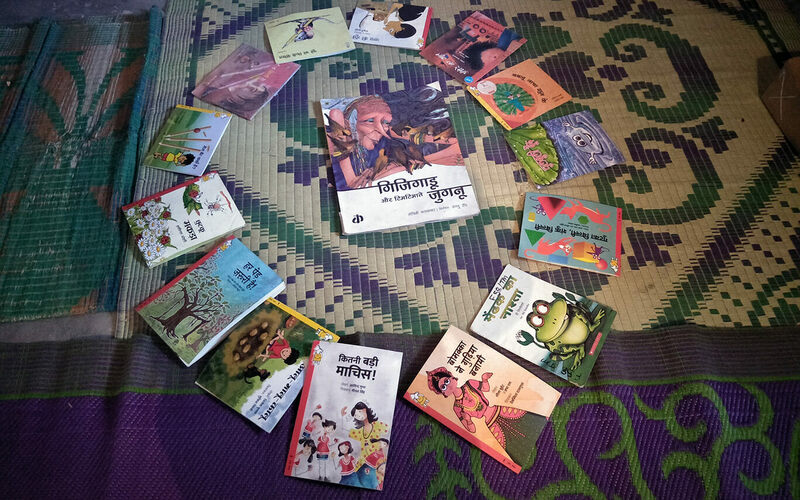 Since few children’s books of good quality are available in Gujarati, sourcing and making available a comprehensive collection is a challenge. Since library work has just begun, the libraries will work on improving infrastructure through collaborative art and involvement of students and teachers in the next year. Additional book procurement will also be a priority. 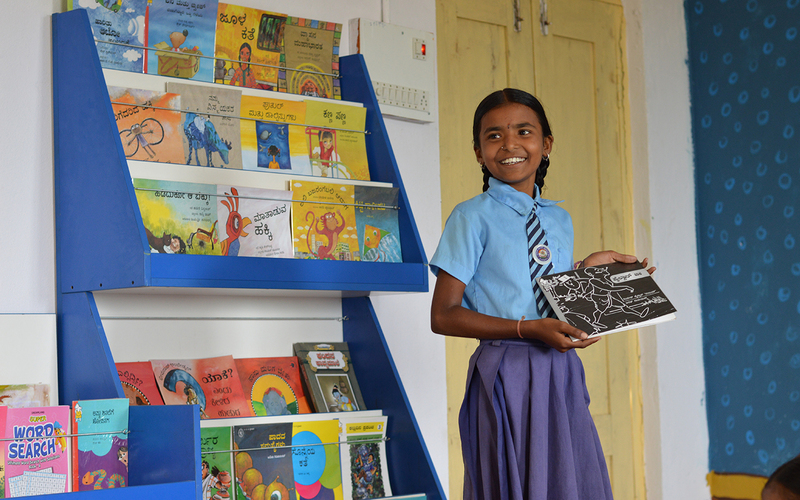 Parag supports 65 school library corners in three districts of Uttarakhand – Nainital, Bagheshwar and Tehri Garwal. 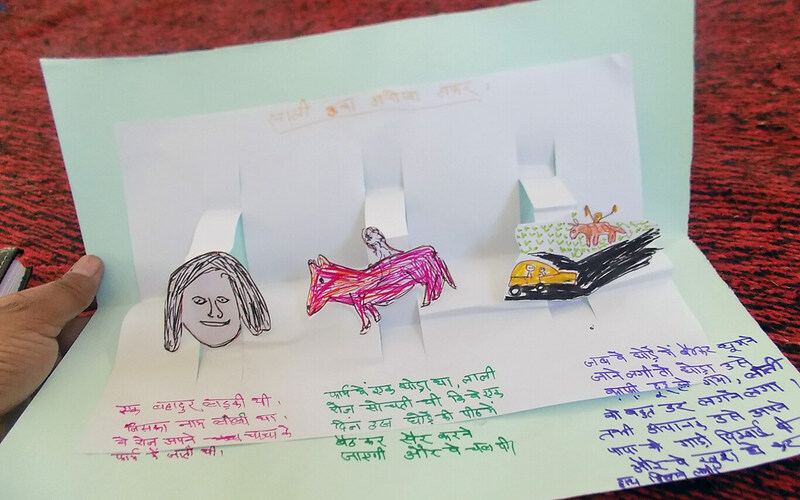 Through its Library Educator’s Course and continuous capacity building, Parag has enabled skill building of team for both partners — Chirag and MVDA. 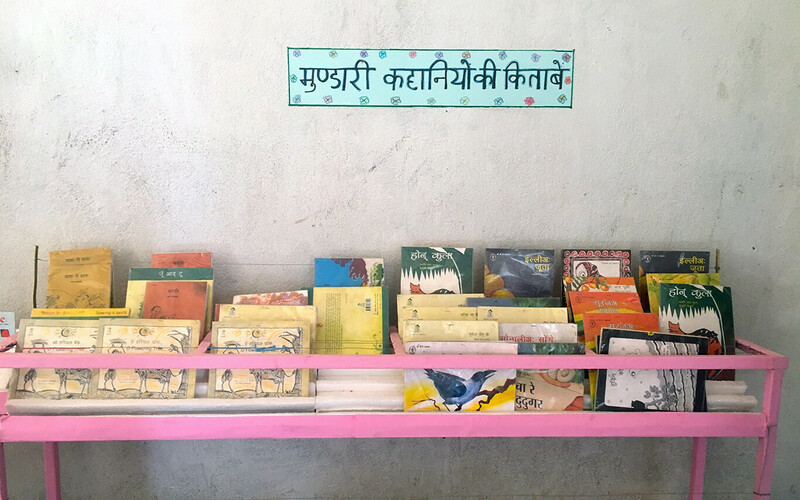 The libraries are supported by Bal Shikshaks, who are from the community. 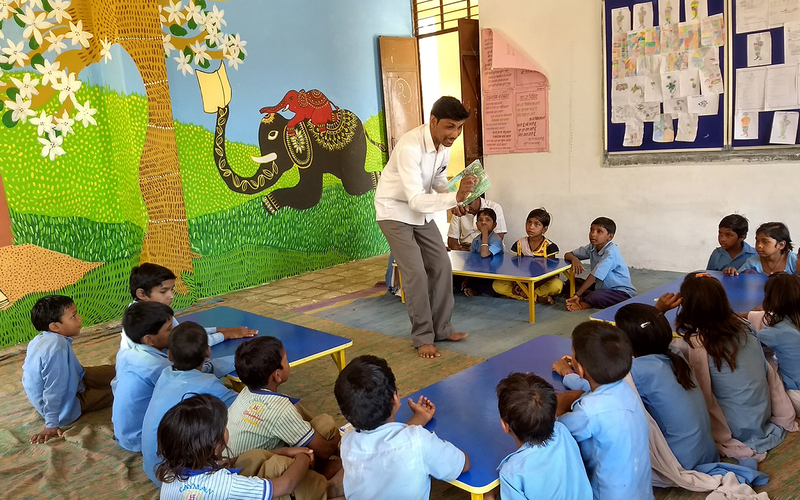 Besides teaching Math and Language, Bal Shikshaks spend 45 minutes every day in taking library session including various library activities such as book talk, read aloud, storytelling. Bal Panchayats are active and perform various library management activities, especially borrowing and lending of the books. 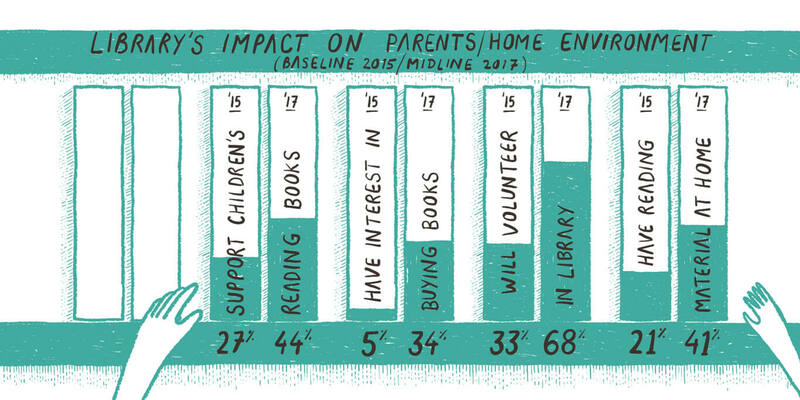 The library corners have a good children to book ratio is 1:9. 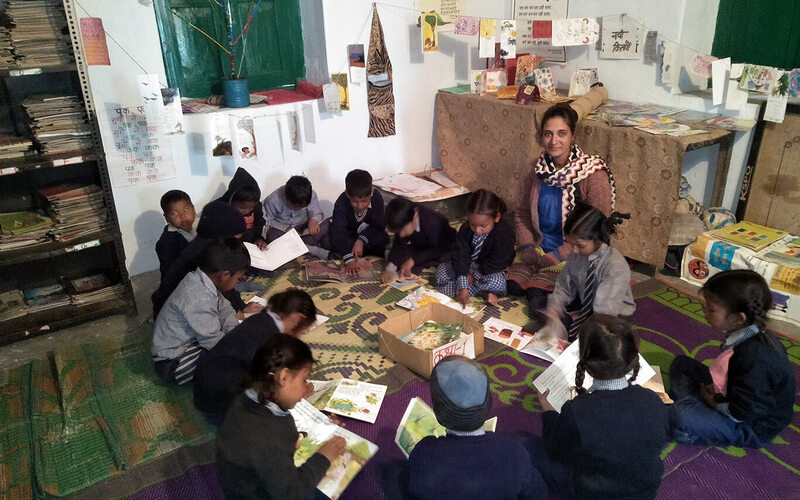 Parag supports 50 libraries in Bali block of Pali district in Rajasthan. Bali is one of the most educationally challenged, with over 40% Scheduled Caste (SC) and Scheduled Tribe (ST) population. 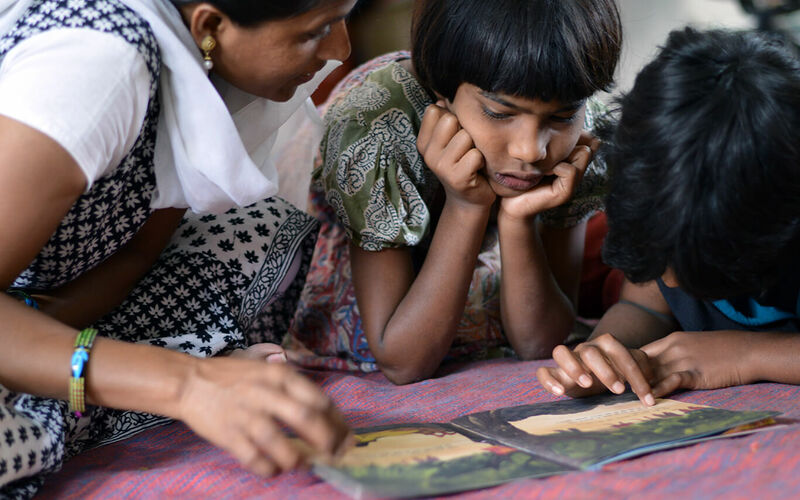 The library programme, although only a year old, hopes to have significant improvement in children’s ability to read with understanding and write to express themselves in the school language. The active and vibrant libraries have enabled children access to age appropriate books and other reading material. 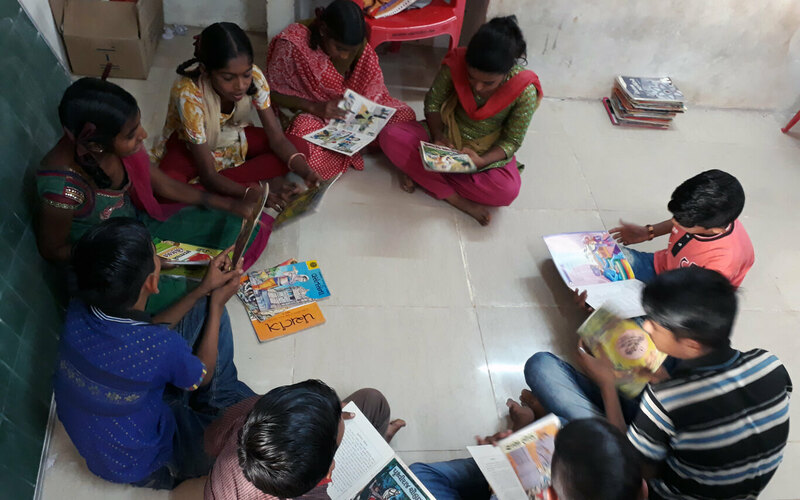 Since the literacy and library programme work hand in hand, Parag libraries are also one of the key tools for building literacy skills amongst students. Oral storytelling as a pedagogic practice plays a key role in engaging students, and laying a foundation for students to develop an understanding of the knowledge they gain during the storytelling process. 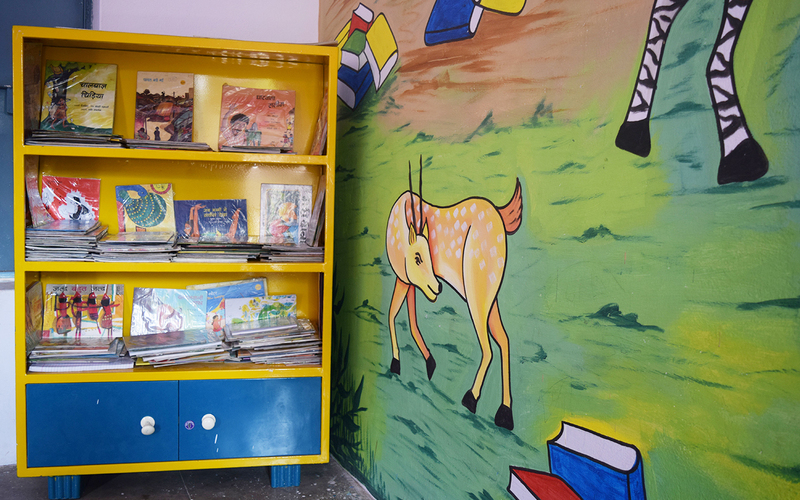 The library also aims to provide a literate environment for neo readers, so that children can use their newly acquired reading skills to read richly illustrated story books in their own language. Library activities such as book talks, read aloud and discussions also encourages children to continue reading and hone their skills. The libraries have active involvement of teachers, both for the literacy and library components. 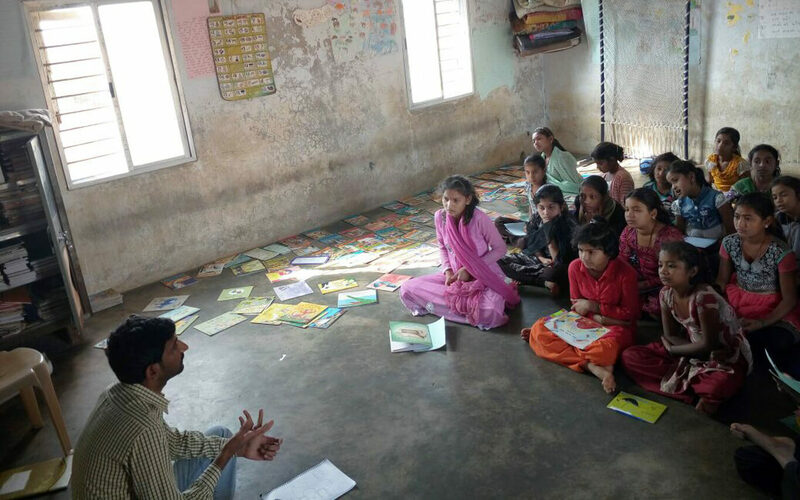 Teachers are trained by Parag and supported through a facilitator who visits a school once or twice a week. 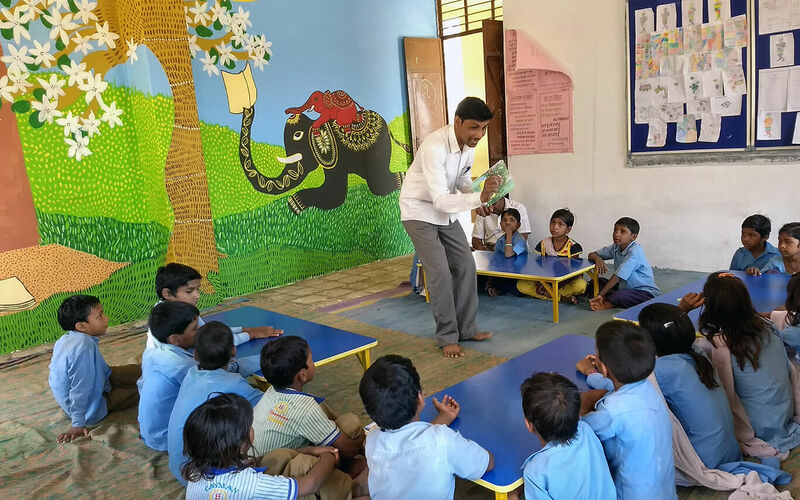 The programme is helping 5,000 primary school children to improve literacy levels and reading skills and experience the joys of reading good children’s books. The libraries have been set up in partnership with Centre for Microfinance, an associate organization of the Trusts. It is implemented by Bodh Shiksha Sansthan. 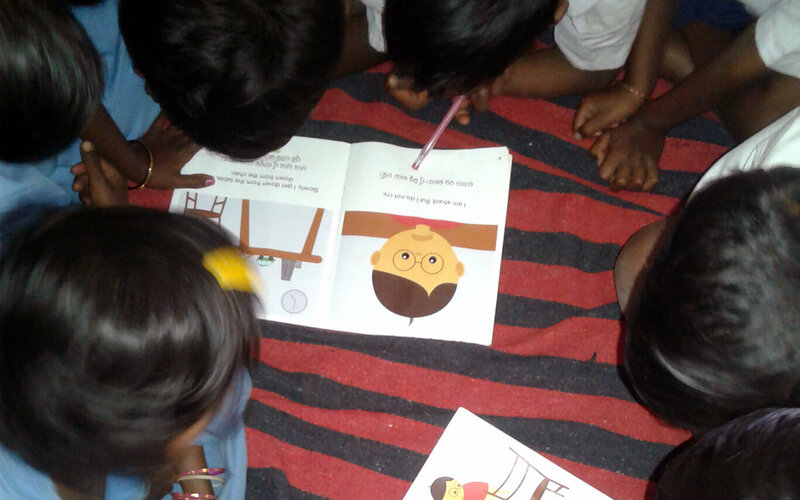 Parag supports 100 libraries in partnership with Kalike, in Yadgir district of Karnataka. 40 libraries, with dedicated rooms, have been set up in government schools that had existing literacy intervention, in Gurmitkal block. 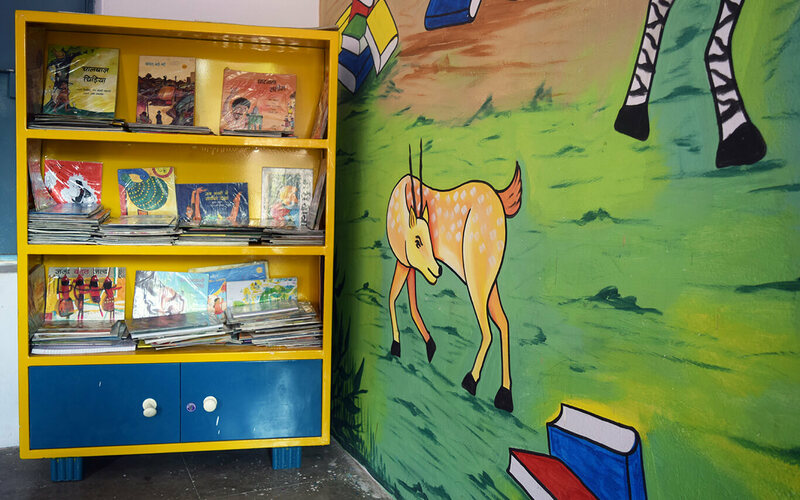 One wall of each library room was transformed through collaborative art by children, library facilitators and artist Ms. Abha Bhagwat. 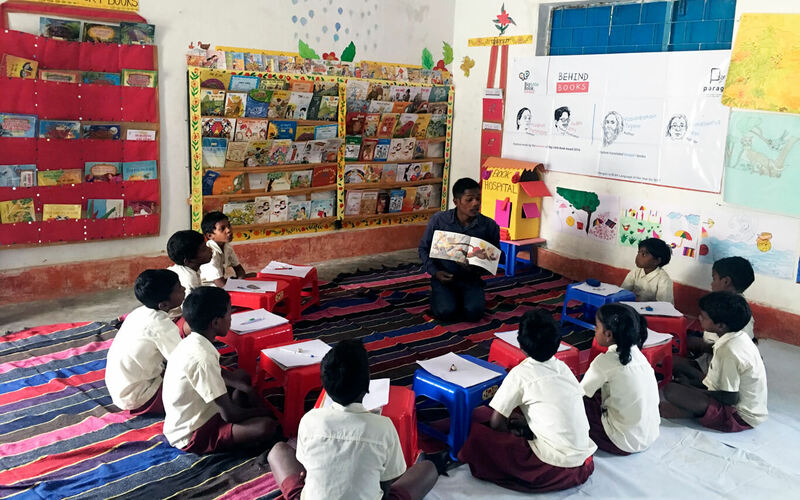 Child friendly furniture, rugs and book shelves with a rich collection of Kannada children’s literature were provided. 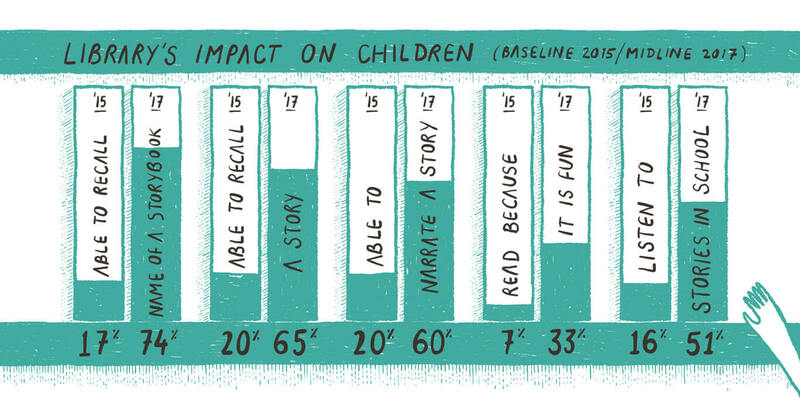 Most importantly, 40 library facilitators were trained to set up and activate vibrant children’s libraries. It has been two years since the libraries became functional and lending and borrowing is in full swing today. Children look forward to library periods which often have carefully planned activities to introduce children to new books, new genres and discussions around books read. 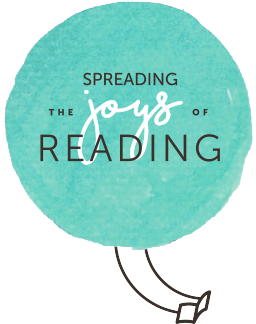 Parag libraries offer a rich reading resource for children of ages 6-14 and an opportunity for children to learn to be creative through verbal storytelling and art. 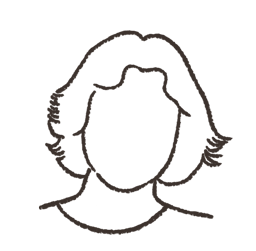 You can read a case study of activity best practices in Parag libraries here. Another 60 libraries are being supported by Parag in Yadgir block. 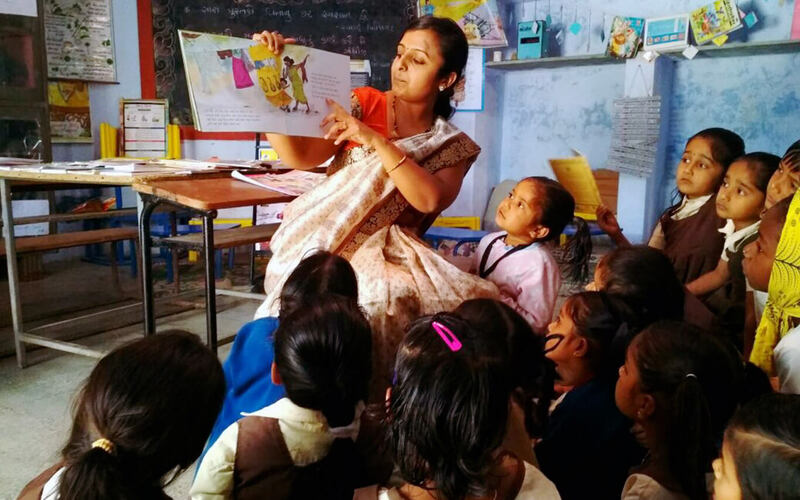 Parag supports capacity building of teachers who are in charge of the school libraries and with continuous support enables them to run active school libraries. The library collection has also been strengthened with more books. The book issuing used to happen before Parag libraries were set up as well, but it was much less, the books …were not really appropriate for younger kids, so they didn’t issue… teachers issued them more than students. Now we use the resources from the library in our teaching plan and encourage children to take books home.